This will make a yummy alternative to greasy pizza! The kiddos will enjoy making this every time! We use this naan for pizza often as it isn't as thick as regular crust. blend together store in airtight container. 2Heat Olive Oil in skillet, season chicken with herbs de Provence and house blend, cook fully. 3Spoon 2 oz of alfredo sauce on each bread. 4Sprinkle about two Tbs of cheese on sauce. 5Add remaining ingredients evenly as possible to each pizza. The order doesn't matter. 6Cook until bread just starts to crisp and cheese is melty. Let cool and enjoy! 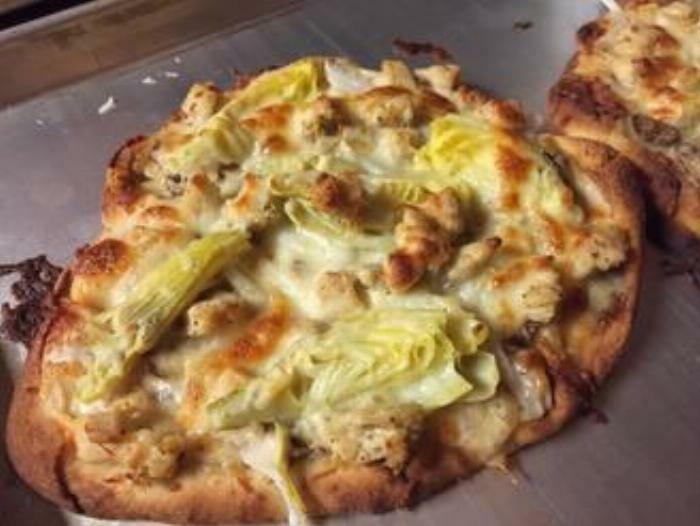 You can also vary this recipe by adding bbq sauce, omitting the artichokes, alfredo and changing the spices up a little!